Today was Sunday, early in April. I went to the abandoned ‘’opsiyias’’* amongst the vineyards of Hagia Eirini. I was in a childish mood. The mood you are in when you are in a secret place, that you only discovered , expecting a surprise. Even last year I found there wild gladiolas, poppies and five other wild flowers without a name. Aretousa Ieronimaki paints, inspired by cretan nature. 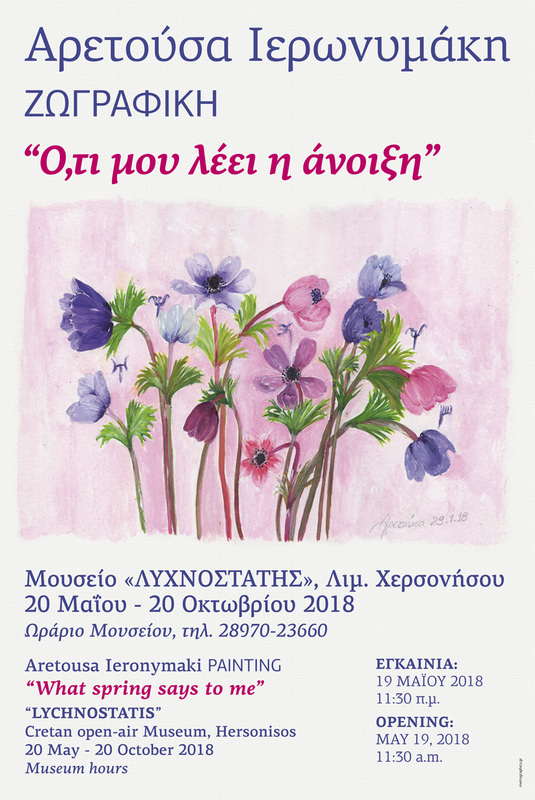 The painting exhibition "What spring says to me", is held in the temporary exhibition hall (Oddysseas Elytis) till 20th October 2018.